Meralco is facing issues and one of them is the proposed increase of P4.15/kwh in electricity. This has raised the eyebrow of so many people and caught the awareness of different groups and one of them is Bayan Muna. The said charge is on December 2013 bill and will reflect on the bill for the month of February. Because of the increase, there are different angles that the group is looking at that might be the big reason behind the hike. The hike is the subject of the petition of the group “Bayan Muna” for the Supreme Court. Bayan Muna’s Teddy Casino said that during his conversation with a Meralco agent in its call center, the agent advised him to ignore the total amount due and will only pay the total current amount. Casino said that Meralco intended to do this because of their desperation to pay the bills issued to them by the Energy Regulatory Commission (ERC). In fact, they will also ask the commission to stop issuing them the bills. Bayan Muna is dedictated to fighting for the rights of the consumers against the passing to them the covering up of Meralco’s losses in December. They look at the issue as something unfair and it should not be the responsibility of the consumers to cover up. It happened because the company bout higher electricity from the Wholesale Electricity Spot Market (WESM). The reason for this is that Malampaya natural gas facility is undergoing maintenance that requires shutting down. This issue has cultivated lots of sentiments not just from Bayan Muna but from the Filipino consumers as well. Some look at this as an additional burden to them in the midst of crises. There are even Filipinos who experienced disconnection due to the fact that they cannot pay anymore their bills. How about you? What is your stand regarding the issue? 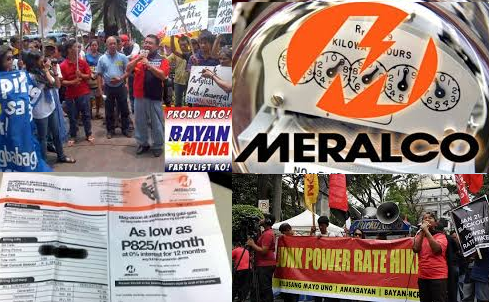 Is it okay for you to pay the increased amount in order to cover up the loss of Meralco? Do you support Bayan Muna’s campaign? If yes, why? If no, why not?